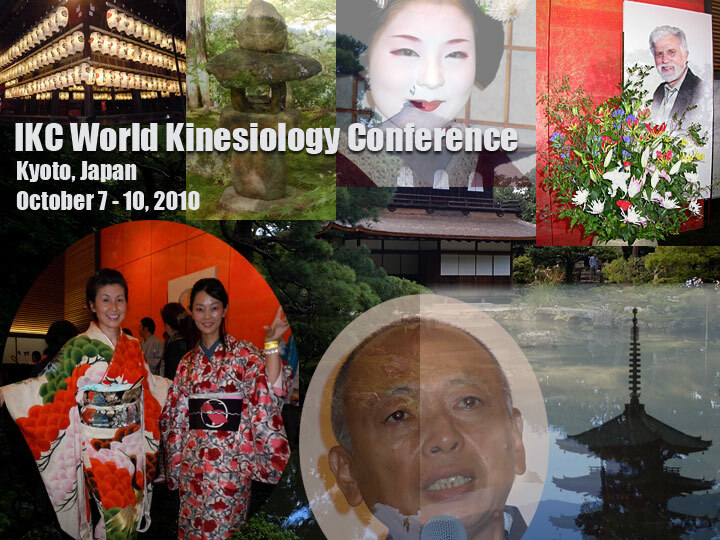 This was a historic conference in that it was the first held in Asia in the 20-year history of International Kinesiology College (IKC) conferences. Kenichi 'Dharma' Ishimaru, IKC Faculty Member for Japan, was the organizer and planner for the conference and was supported by a great staff of smiling, helpful and enthusiastic staff. 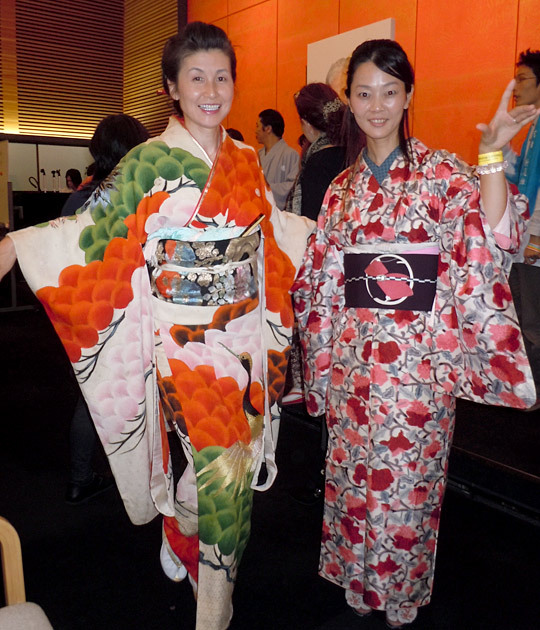 Traditional Japanese dress and customs were elegantly woven into the presentation of the conference. 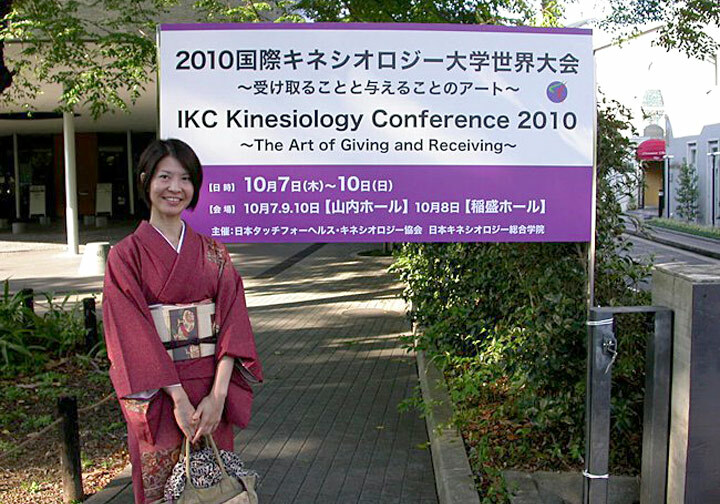 The IKC World Kinesiology Conference was held at Kyoto University's beautiful Shiran Kaikan conference facilty. 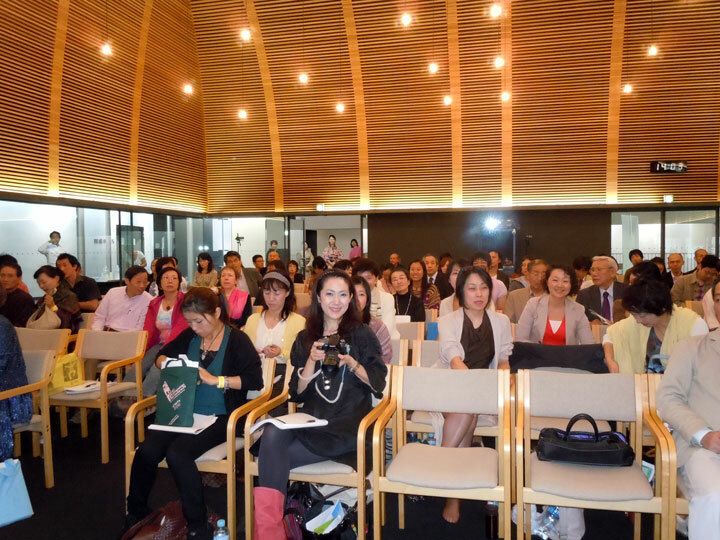 The conference was attended by people from 18 countries with speakers from 13 countries. 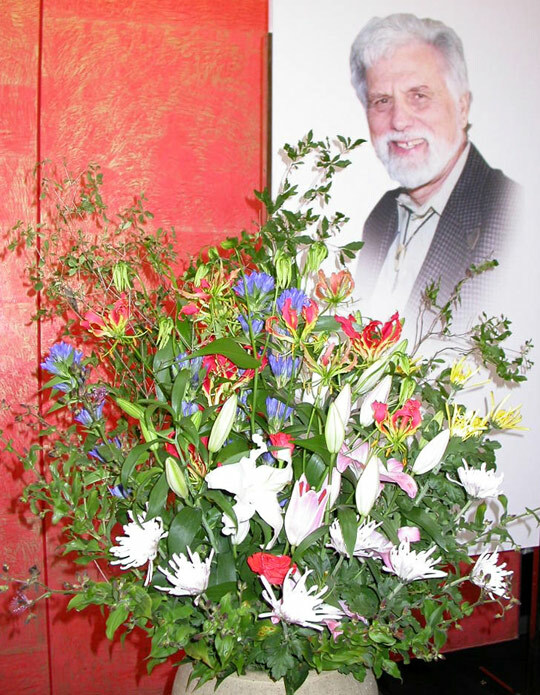 Photos of Dr. John Thie were placed throughout the venue and his smiling face overlooked the conference. John was a mentor to Kenichi as he was also to me. This was a powerful and beautiful sentiment and brought tears to my eyes on more than one occassion. 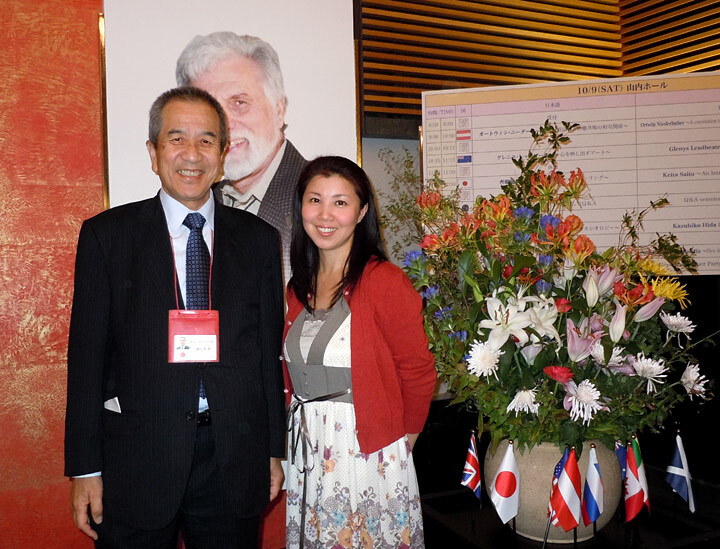 Hagiwara Seiko and Junko Soutome welcome guests to the conference. 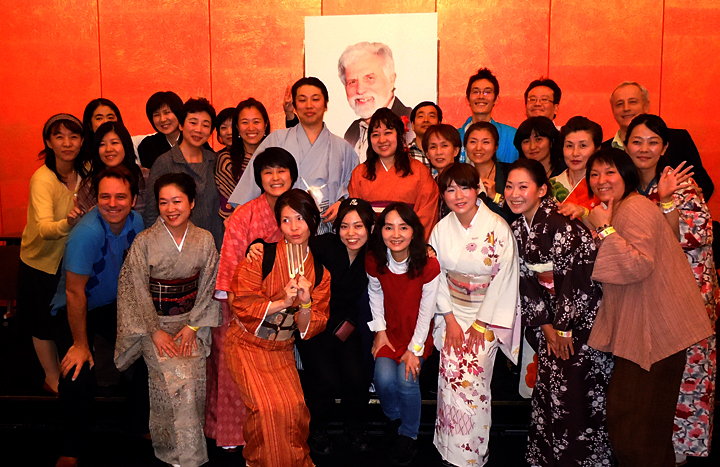 The lovely ladies' smiling faces and their beautiful kimonas were a cheerful way to be greeted. The facilities were exceptional. There was good attendance from the local Japanese community. 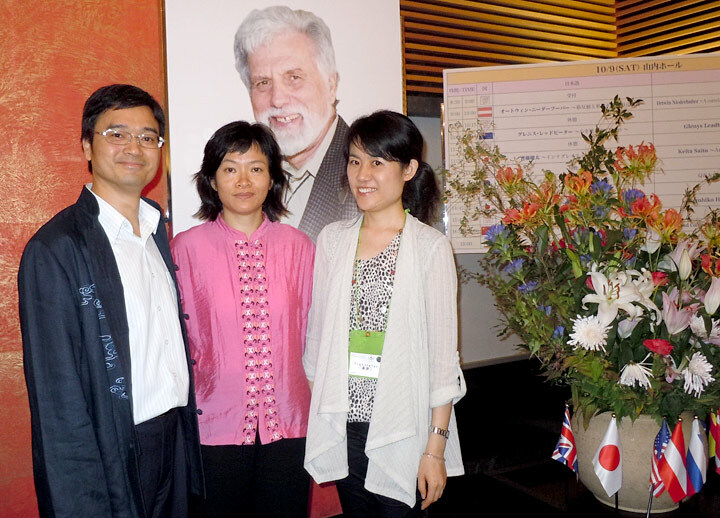 Kenichi has done a great job of energizing Japan and creating such a successful conference. Amy Choi and Conrad Ho of Hong Kong lead the audience through their Five Element Animal Moves. This is the Tiger Leaping move. The audience really enjoyed the active participation. I began my talk with a group balance and with the goal, "May we be receptive to the Art of Giving and Receiving". Then everyone performed a 14-muscle meridian balance while viewing the Meridian Dance. It is obvious to me that people like to move at kinesiology conferences! Dr. Paul Dennison, founder of Brain Gym and EduK, is interviewed along with Sieta Saito and Glenys Ledbeater by the local Japanese press. 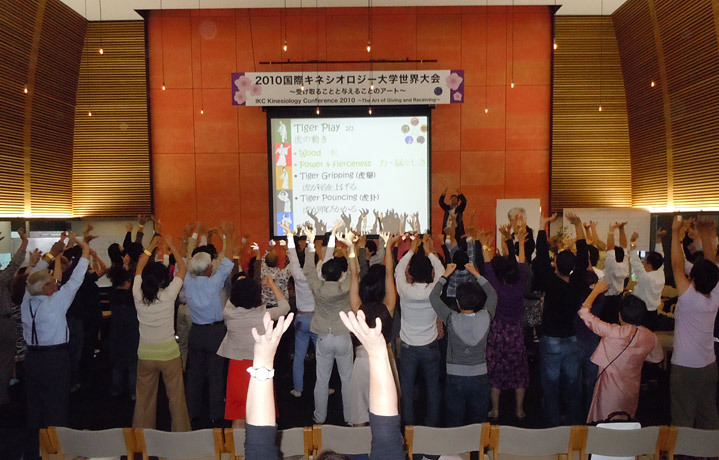 Brain Gym is one of the world's most successful and widespread kinesiologies. It is responsibile for helping millions of children all around the world overcome learning problems and to help them improve their learning skills. IKC Faculty Members present included: Kenichi Ishimaru - Japan; Anne Hiitla-Pederson - Scandinavia; Amy Choi - Hong Kong; Matthew Thie - USA; Wayne Topping - Scotland; Ger Casy - Ireland; Toni Lilley - Australia; Alberto Arriberga - Spain; Ortwin Niederhuber - Austria; and Sandy Gannon - President IKC - Great Britain. 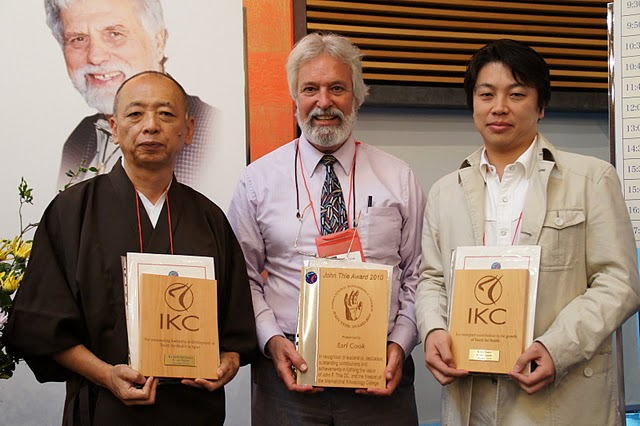 Kenichi 'Dharma' Ishimura, Earl Cook and Keita Saito received awards from the IKC. Kenichi's award was presented for his years of contributions to Touch for Health in Japan and for hosting the conference. 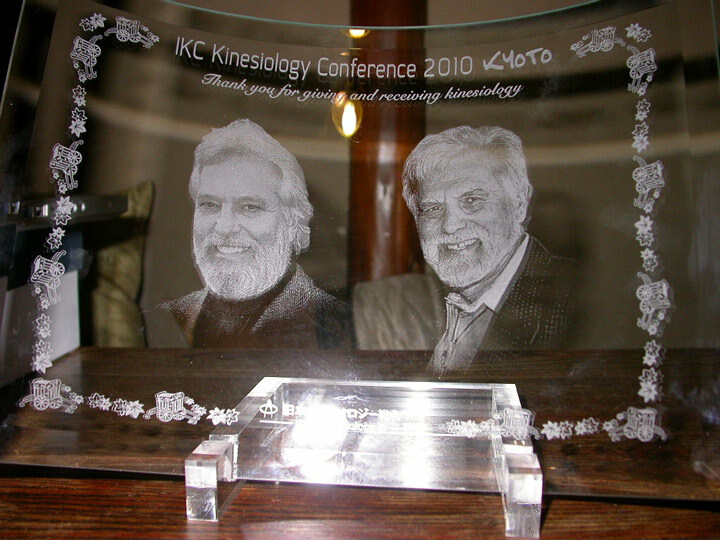 Earl was presented the 2010 John Thie award for his, "Leadership, dedication, outstanding contributions and achievements in fulfilling the vision of John F. Thie, DC and the mission of the IKC." Keita was presented an award for his recent contributions to TFH and for his efforts in growing TFH in Japan. Earl also delivered the opening address. Seita spoke on Opening the Shakra Gates of Healing. 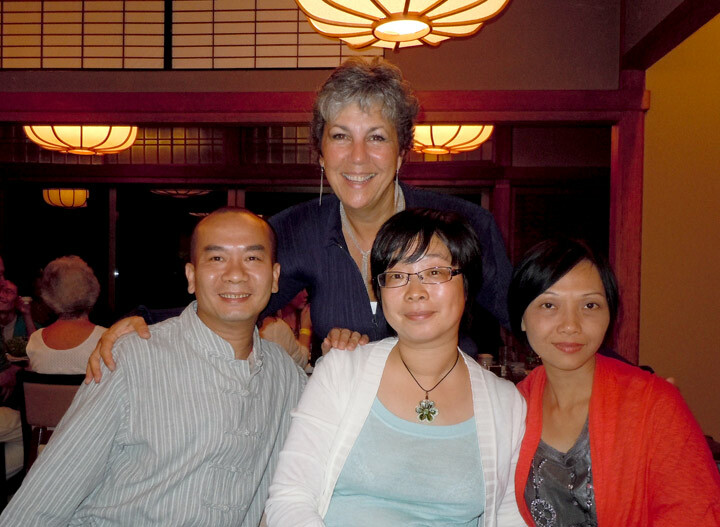 Sandy Gannon, President of the IKC, stands with the Chinese delegation of Chris Wong of Shenzen, Hua Zheng of Bejing and Donna Kam of Hong Kong. It was difficult for them to get through all the official channels to attend so this was a celebration. 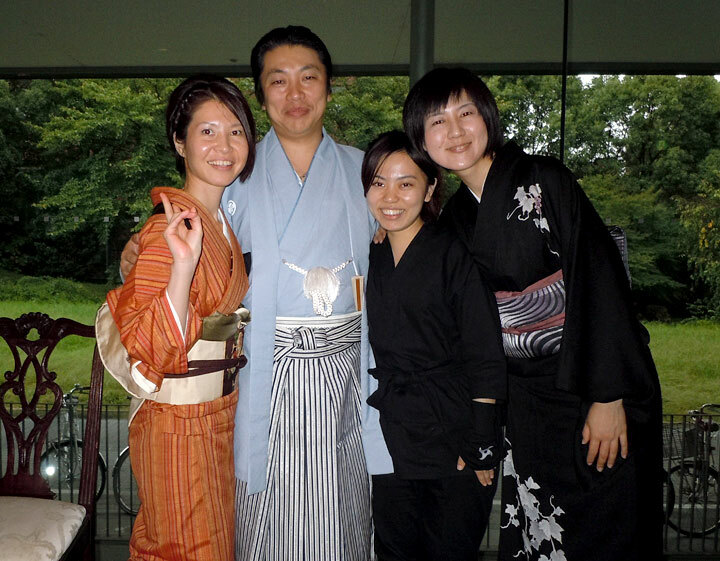 Keita Saito, center, with Yokino Saito, left, Etsuko Kuroda and Eiko Sadakane. Keita won a special award for his work in Japan. 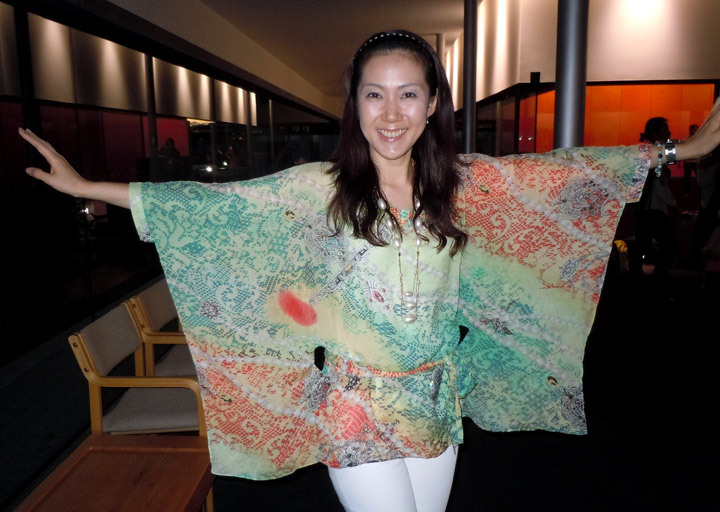 He is from Yokohama and emphasizes what he calls 'Kin - easy - ology' and introduced his ideas on Integrated Healing. Kazuhiko Hida of Japan stands with Tomoko Otake. Hida spoke on Buddhism and Kinesiology. Conrad Ho, Amy Choi and Michiyo Nakagami after their presentation on the Five Animal Play balancing movements. The audience really enjoyed this presentation as they went through the movements of the five animals: tiger, monkey; bear; bird; and deer. 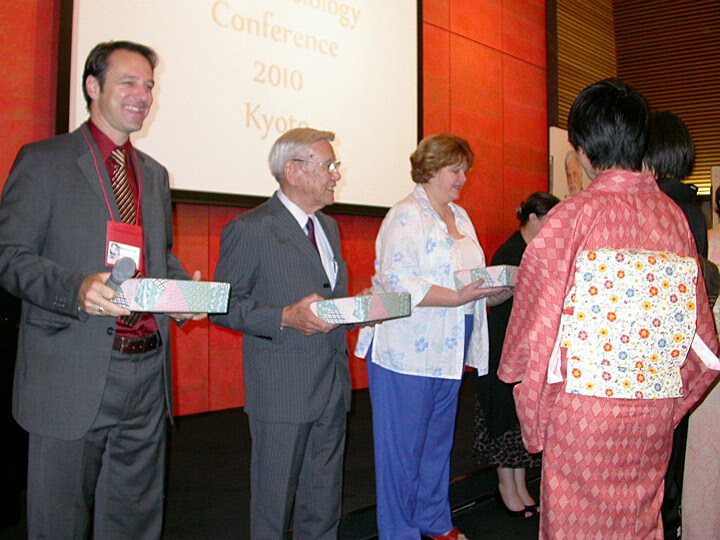 Matthew Thie, Kazutoyo Izumi and Toni Lilley are presented gifts for their parts in the conference and for service to the IKC and Touch for Health. The speaker's gifts are lovely! Each speaker received this gift in which their photograph was etched into the glass along side John Thie's. Tomoko Otake and Kenichi 'Dharma' Ishimaru. 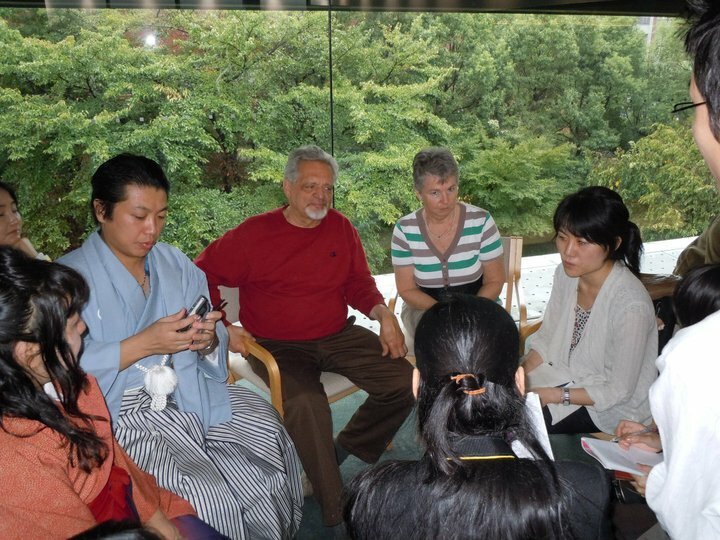 Dharma is the IKC Faculty Member for Japan and organizer of the conference. He is also the innovator of the Zen Kinesiology techniques. He will be holding classes in Malibu, California and New York City during December, 2010. Click for more info on these classes. 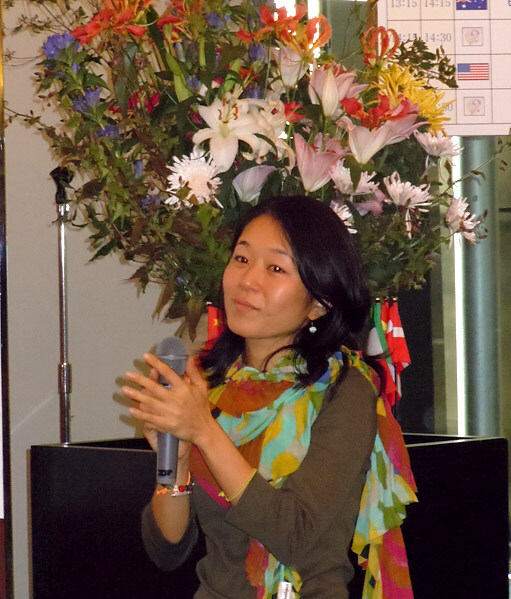 The conference organizer behind the scenes was the lovely and energetic Kayoko Sawamura. Volunteers, speakers and guests pose for the camera. Taking photographs in Japan is an honored and fun experience. Minoru Odawara was the sound / projection man and did a great job. He had a great attitude, was always helpful and always had this big smile on his face. It was fun working with someone who had so much enthusiasm for what he was doing. 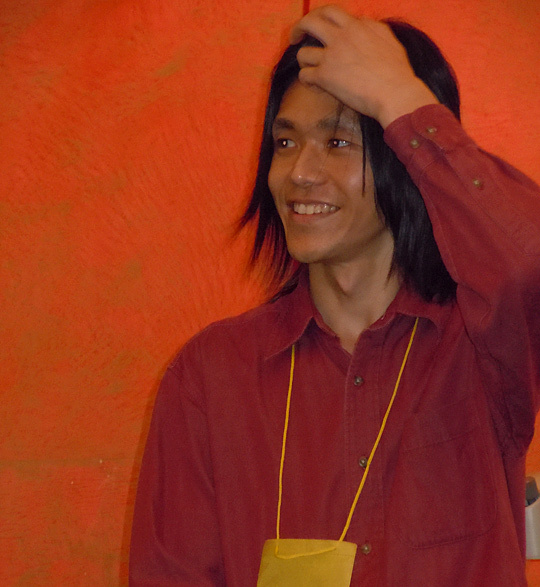 Naoko Tamaki was the official photographer for the conference. She is lovely in front of the camera also!